Happy Monday – hope you all enjoyed the weekend! Can you believe today is the first day of August?! Where the heck has the summer gone? I also have so much to fill you in on. Work is always so hectic during the week that I just don’t have the energy/time to blog at night and then I fall behind on updating you all! But anyways, the past few weeks I’ve been playing in a coed soccer league with my coworkers. Soccer was my big passion when I was younger, so I was pretty psyched for this league going into it. I have to admit though, it’s been quite the challenge. We were supposed to be in the “just for fun” league, but there weren’t enough teams so we got bumped up into the intermediate league – which might as well be professional compared to the level of our team. 😉 So we’ve been losing each game pretty horribly, but worse than that is just how tough it’s been on my body! I have no problem with all the running, but the sharp turns and sudden movements have been a serious struggle. I’ve gotten so used to running in a straight line at a relatively even pace! In last Monday’s game, I went to kick the ball and I think I turned my foot at a weird angle and suddenly experienced a shooting pain in the top of my foot. I tried to jog it off, but I was also freaking out that I had injured myself so I subbed out after a minute and spent the next 15 minutes or so on the sidelines icing the top of my foot. It didn’t look crazy swollen or bruised, but it was very tender. I iced and elevated it that night, but it was still bothering me the next day walking to work. So in typical runner-fashion, I blew it up in my mind and immediately started thinking about stress fractures or tendon strains and made an appointment with the doc to have it looked at. I didn’t run the whole rest of that week and was hyper-aware of any and all twinges on the top of my foot. Luckily, it felt less painful with each passing day and I was able to hop on it without any serious discomfort. I went to the doctor on Friday and they took X-rays, which confirmed – THANK GOD – no stress fracture!! She recommended I dial back the miles for a bit and just continue to ice, elevate, and take plenty of anti-inflammatories. I’m guessing I just strained a muscle in my foot, but thankfully, it does not seem to be too serious. On Saturday, I decided to test out a short run with the plan to cut it short if I felt any pain. I loosened the laces a little over the spot, which did feel slightly tender when I first pulled my sneaker on. Once I started running though, I felt completely fine. I was on the treadmill and threw in a couple of small hills and short sprints, all with no issues. Yay! I’m so glad this turned out to be a false alarm. Utah is only 3 weeks away and I am so excited for that trip. I would have been so bummed if I had had to sit that race out. I think this may be it for my soccer career though! I have had a lot of laughs playing with my coworkers, and while it has been fun, running is my main priority right now. I have a lot of goals when it comes to future half marathons and marathons, and every time I play soccer, it feels like gambling with injury. Have you ever had a similar experience having to give up an activity you used to love? 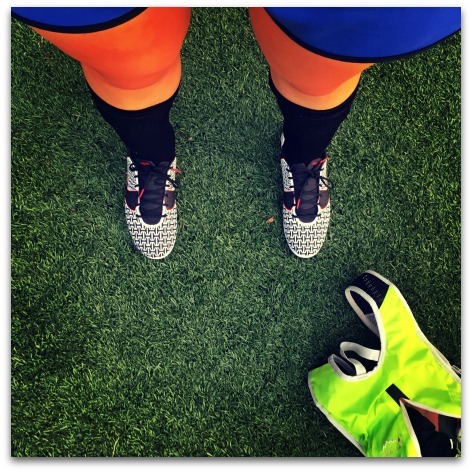 This entry was posted in Life and tagged Half Marathon Training, Running Injuries, Soccer, Utah. Bookmark the permalink. Glad your injury scare turned out to be nothing scary! I had to quit soccer for the same reason… I was constantly getting hurt and it didn’t seem worth it anymore. Which is too bad, because I miss it sometimes! Soccer? Soccer? NO, no, no! You run, girl!